We are a group of women who are interested in supporting our local community in the Greater Sarasota area by combining our donations to impact local charities. We come from all walks of life and different financial backgrounds. As a group, we have the ability to contribute to the growth of our community in ways we never before thought possible. 100 Women Who Care was started in November 2006 by Karen Dunigan of Jackson, Michigan as a simple way to raise money efficiently and quickly for local charities/ nonprofits/worthy causes. Her group of 100 women, at their first one hour meeting, each wrote a $100 check directly to a charity. In one hour the group raised $10,000 to buy 300 new baby cribs for an organization in their city. Karen’s simple, powerful and impactful concept has inspired a worldwide grassroots effort of giving. Today, there are more than 350 chapters making a huge impact in local communities around the world. 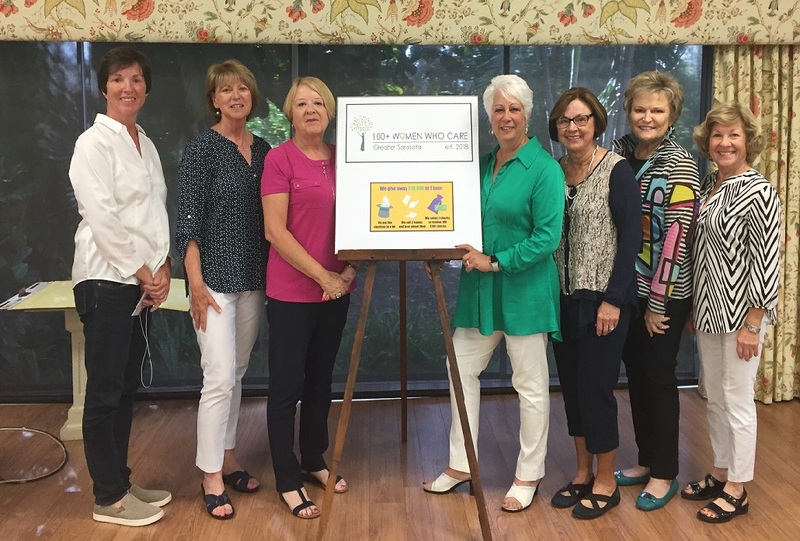 The 100 Women Who Care – Greater Sarasota chapter was launched in January 2018 by a group of women from Sarasota, Florida. We are thrilled to join this movement to benefit local charities. Twice a year we come together for a one hour meeting to select one 501(c)(3) charity in the Greater Sarasota area to whom we will collectively donate $10,000. The charity will receive from our members 100 checks made out directly to the charity. 100 Women Who Care – Greater Sarasota is neither a 501(c)(3) nor an incorporated business. The founders are passionate volunteers who have dedicated their time and talents to making a difference in our community. 100% of the donations are given directly to the winning charity following each biannual meeting. Each of our members has agreed to donate $100 twice a year to an established 501(c)(3) charity serving the Greater Sarasota area. We invite you to become a part of this powerful group and help us have a positive impact on those in need. Just fill out our on-line Commitment Form and you are on your way! 100WWC would like to thank Terry Luft & Mary Kay Fehl for their generous donation that fully maintains and supports our website. We also thank an anonymous donor who funds the cost of the fellowship hall at The Presbyterian Church of the Covenant for our biannual meetings. Join us in making an impact of $10,000 or more on a local non-profit twice a year.